The Red-billed Buffalo-Weaver was collected and formally described by Andrew Smith, a Scottish surgeon, explorer, ethnologist and zoologist. 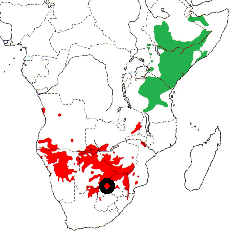 Smith organised an expedition to the interior and he travelled to near the Botswana border in 1834-35, collecting many new birds, reptiles, mammals and other taxa along the way. Smith described the Red-billed Buffalo-Weaver from Kurrichane area. 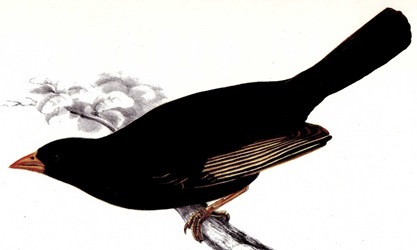 In Smith's Illustrations he expands on the locality given in the type description: 'It was not till after we had passed to the northward of the 25th degree of south latitude that we discovered this bird' (Smith 1841a). Sclater (1930) restricted the type-locality to Kurrichaine, a peak 20 km north of Zeerust. Clancey (1964) restricted it to Zeerust, a town that did not exist in Smith's day. In Smith's diary (Kirby 1940), Smith's first and only reference to the species appears on 1 August 1835. Smith left Tolane on 28 July and followed the Great Marico River to Eerstepoort, which was reached on 8 August. Smith provides daily travel times, permitting an approximate locality to be calculated for 1 August as c.25 00'S, 26 23'E (Oschadleus 2007). This buffalo-weaver was not recorded at Zeerust during the atlas (Harrison et al. 1997), but was recorded rather frequently along the Marico River. Thus the type locality is best described as Great Marico River in North West Province. The first illustration of a Red-billed Buffalo-Weaver was published by Andrew Smith in 1841 in his well known work, Illustrations of the Zoology of South Africa, being painted by George Henry Ford. The next illustration was published in Reichenbach (1863), being of a male in a similar pose to Ford's illustration. 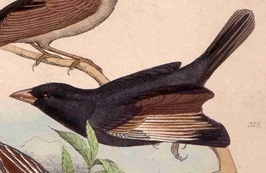 Bubalornis niger	Smith 1836; Rep. Exped. Centr. Africa, p.52; 'Country about Kurrichane'. niger - Latin: niger, black, shining black (cf. ater, matt black, dead black). Black Buffalo Weaver, buffalo-bird, Coral-billed Weaver, Northern Red-billed Buffalo-Weaver, South African Buffalo Weaver, The millet eating Alectornis. Kurrichane = Great Marico River, North West Province, South Africa. One type specimen is known: Edinburgh NMSZ 1843.028.001, though there may be more.